Here are the latest updates on the market trends in Sevier County residential real estate. A quick glimpse shows the average sales price to continue downward. However, market activity has unquestionably picked up considerably with 198 sales in May and 182 in June. These are the highest totals in our MLS since August 2006 as far as number of properties sold. Total sales volume surpassed $24 million for the first time since December 2007 with May at $24.77 million and June at $24.58 million. The selling price vs. list price ratios have continued to stay fairly consistent even through the downturn. Properties in May sold at 94.21% of listing price and 94.42% of listing price in June. This can be a little misleading at times because it reflects the most recent list price and doesn’t take into consideration the original list price on a property if it had price reductions before it had sold. These statistics take into consideration all residential sales within Sevier County. This includes regular residential homes, overnight rental cabins, condos, and any other single family property. The number of residential sales seems to be outpacing the number of cabins being sold. This is in large part the reason for the continuing sales price trend downward as the average permanent resident sale is considerably less than the average rental cabin or second home/vacation property. The number of foreclosure and short sale cabins for sale is considerably lower than in years past. For the last several years our market has experienced depressed prices in overnight rental cabins, in large part due to the high number of foreclosures and short sale. The distressed properties dominated the market and drove prices of other rental cabins down (if they were able to even sell in the first place). These factors caused building of rental cabins to a near stand still. It didn’t make financial sense to builders (or investors) to build because the cost to purchase land and construct a cabin was considerably higher than the cost to buy a quality distressed rental cabin. During 2013 foreclosures and short sales have decreased significantly. In the past years, it was common to have well over 100 cabin foreclosures/short sales active on the market. Currently, there are less than 50 (with many of them not being desirable properties). The shortage of distressed properties has caused prices of cabins to increase slightly. This is going to, and to a certain extent already has, opened up a market for new construction cabins. Cost of land has yet to see the price increases cabins have, and in many circumstances land is trending lower in cost. There is an abundance of land for sale and the buyer market is nowhere near absorbing the inventory. In order to keep aware of the developing trends and changes in our local real estate market I frequently pull the overall sales statistics from our local MLS. Below are graphs indicating various statistics including the average residential sale price in Sevier County (per month & per year), the overall residential sales volume per month in Sevier County, and the number of residential sales in Sevier County per month. Please note these figures and graphs include both primary residence residential properties along with overnight rental cabins and second homes. 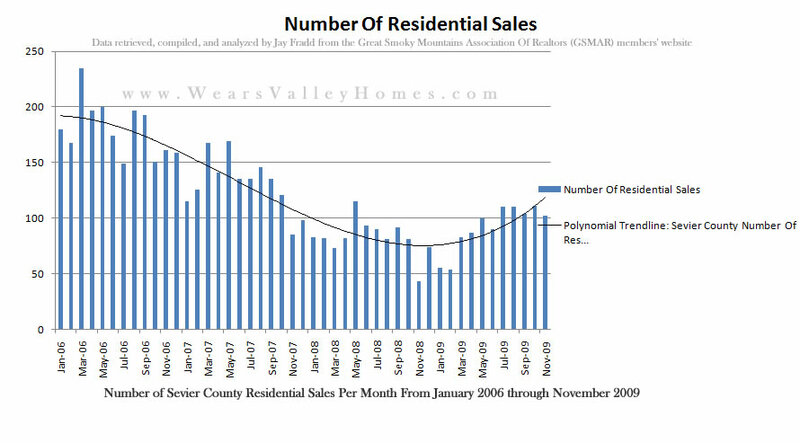 So, these graphs are indicative of the Sevier County market in its entirety, not just the cabin market. It would be very labor intensive and time consuming to evaluate the cabin market accurately due to the way our MLS is setup and the Realtor input on properties. For instance, not all Realtors classify the exterior of a property correctly as being a log home or have the use of the property as an overnight rental cabin correctly identified. With that being said, below are the graphs I created for the Sevier County Residential real estate market from 2006 to April 2013. Starting around the time of the Bear Sterns crisis and financial meltdown in 2007 and 2008 foreclosures and short sales in the Sevier County began to occur at a more rapid pace than in the past. During the time from 2008 to 2012 foreclosures and short sales dominated our cabin sales market. The properties listed as foreclosures and short sales were frequently priced very aggressively creating good investment opportunities for my clients and other buyers in the area. It was a period where the distressed properties were nearly exclusively what me and my clients sought and ended up purchasing due to the low prices and high rental income potential of the properties we selected. The market has taken quite a drastic change in 2013. The number of quality cabin foreclosures and short sales in 2013 have decreased dramatically. There are still some foreclosures and short sales available, but there is more competition over these properties. It reflects a simple supply and demand. The number of foreclosures (supply) is down considerably than the 5 years in the past, while the ready, willing, and able buyers (demand) has stayed the same or slightly increased. This has caused many of the foreclosure cabins that are aggressively priced to go into multiple offer situations and being bid up past the list price. Many foreclosures now have the “first look period” where investors have to wait a period (such as 15 days with Fannie Mae properties). In the past, my niche and advantage was staying extremely up to date with the new foreclosures coming on the market with e-mail alerts and extensive research on my part. This enabled me to be among the very first to notify my clients of what I considered to be excellent deals on the cabins. Now, with the waiting period of up to 15 days, it allows other agents and buyers plenty of time to recognize a good deal on the market. If there is an aggressively priced property on the market that is a foreclosure, you can rest assured a lot of other people are aware of the property as well. Due to these developing market conditions, I have added an additional approach to obtain the very best deals I can for buyers. 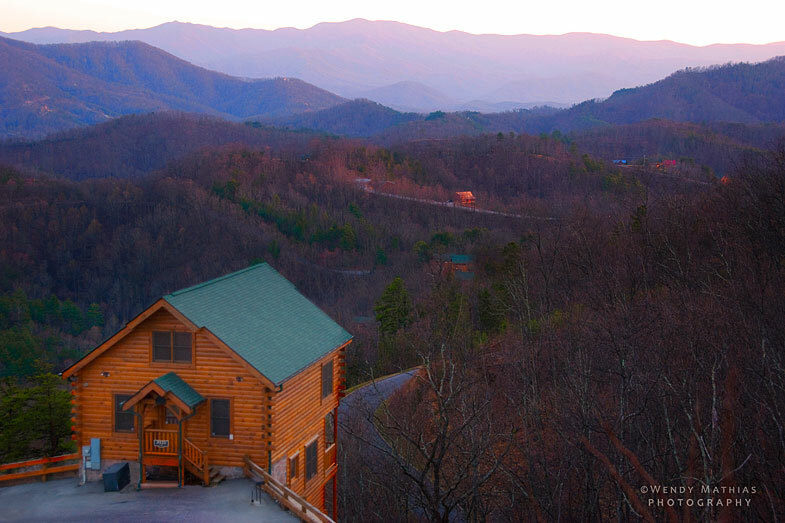 For the past few months it has seemed the inventory of quality foreclosure and short sale cabins in the Smoky Mountains has decreased. When I say quality foreclosure and short sale cabins I refer to properties that would return a good investment and be a good overnight rental cabin. Some of the features, in my opinion, to qualify for this would be having a good mountain view or a good location (in a good subdivision/resort). The buyer competition for aggressively priced properties has certainly increased. In part, because of Fannie Mae and Freddie Mac policies of a 15 day waiting period for a second home purchaser or investment buyer. This policy has caused the property to be on the market for 15 days and creates multiple offer situations which tend to drive up the purchase prices on properties in most circumstances. My curiousity led me to study the statistics of sold foreclosures and short sales from the period of February 15, 2011 to March 29, 2011 (the day I am writing this). Below is my analysis of what I have gathered based on these sales. I primarily deal with buyers and my main objective is to locate the best deals I can find for those buyers that still meet their list of stated criteria. Naturally, a majority of these are foreclosures and short sales. I have represented buyers in the purchase of several Fannie Mae owned properties in the past. Generally speaking, I have no major compaints about how those were handled in the past. The local real estate brokers handling the Fannie Mae owned properties (primarily Re/Max All Pro in Gatlinburg) are very competant and do a very good job on their end marketing the properties, paying attention to the details, and overall doing things in an ethical and professional manner. Now, they along with local real estate agents representing buyers are faced with what I consider an absolute terrible policy – “The Fannie Mae First Look Initiative”. Owner Occupants and people using the property as their primary residence OR entities using public funds (non-profits, local housing and community development agencies) must wait until the property has been officially listed for sale for 5 days before offers are considered. People or entities purchasing the property as an investor or second home must wait 15 days before their offers will be considered. It has been quite a while since I have had a real estate related post on here. I’ve been meaning to write about a variety of different topics, such as development I foresee having a large increase in foreclosures in the near future and what I have been seeing lately in the real estate market. I have also thrown around the idea of creating a “Jay’s cabin of the week” where I list what I find to be the best deal on the market for several different price ranges. I know it can be hard from hundreds or thousands of miles away to truly identify what is a great deal. Sometimes things look good on paper, but when you actually see the property it is quite a different story. That being said, when purchasing real estate it is very important to not only consider what the market may do in the future, but also analyze what has happened in the past. 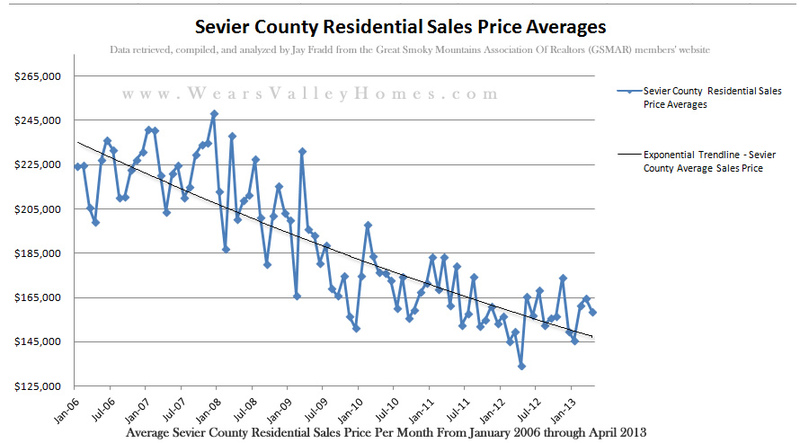 That brings me to the point of this blog post – analyzing the residential sales in Sevier County through November 2009. Please note this includes all residential sales in Sevier County – which is single family residential, condos, mobile homes, and modular homes. 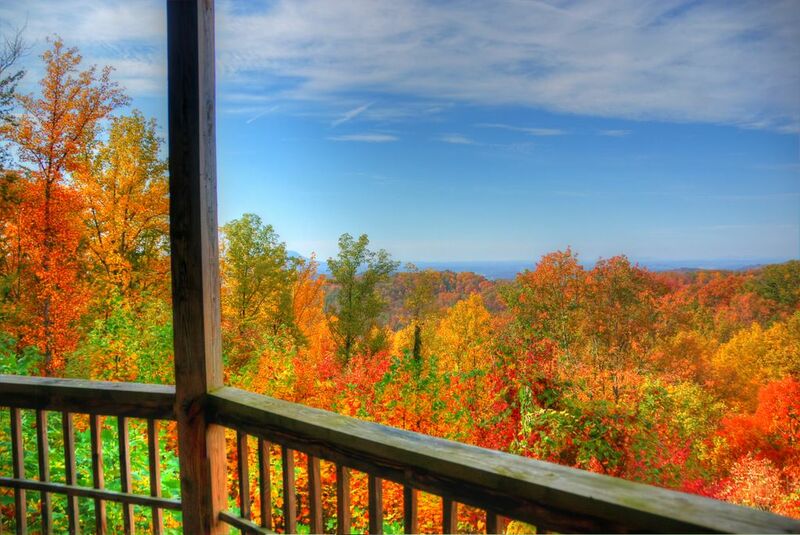 The data is limited to Sevier County only rather than the entire Great Smoky Mountains Association of Realtors. This is for a couple reasons, first that is my primary market area and second when you start including other counties such as Blount, Knox, Jefferson, Cocke, and others it begins to distort the data. As people frequently say “real estate is local” and by narrowing down on one particular county I think it gives a better actual perspective of what is happening in the market. After compiling and analyzing the data. There are a couple things that are easily gathered when comparing 2008 to 2009. First with the “positive” indicators. 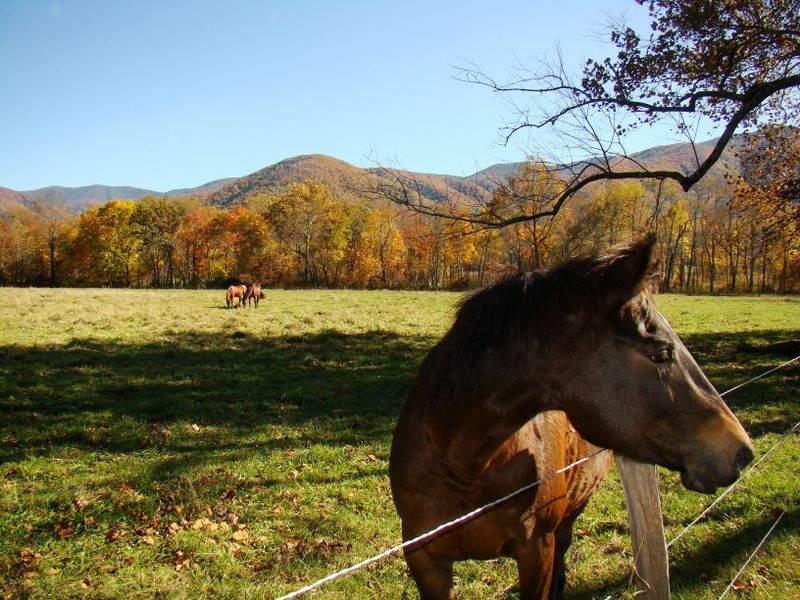 My wife, Brooke, and I absolutely love going into Cades Cove within the Great Smoky Mountains National Park. 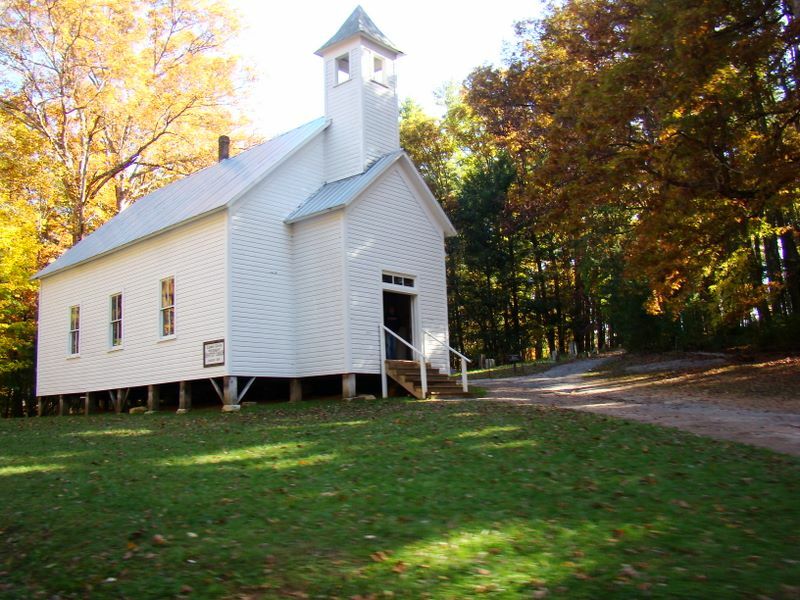 It is hands down our favorite place within the Smokies – so much so that we got married there in the Missionary Baptist Church. It had been a while since we traveled into Cades Cove, so we decided to go for a trip and take advantage of the fall colors. 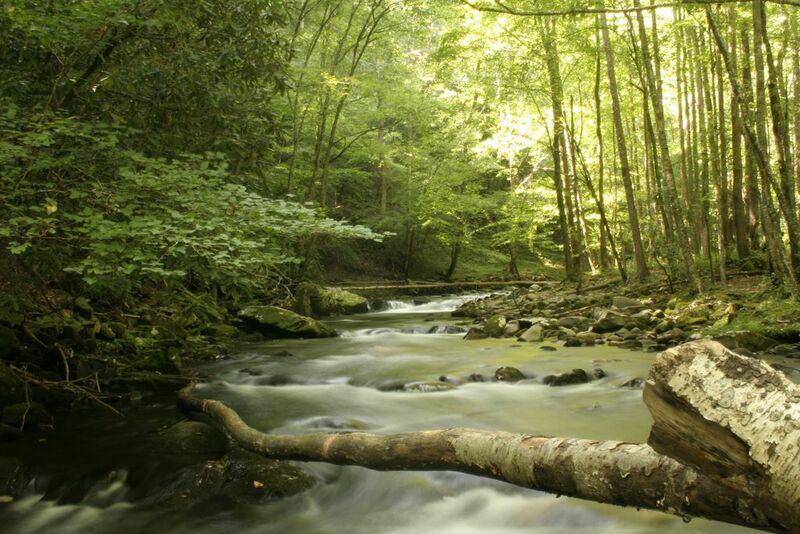 Brooke is also training for a half marathon and she figured there couldn’t possibly be a more scenic training run than the eleven mile Cades Cove Loop! As we drove into Cades Cove we passed through a section of heavily wooded hardwood trees that were some of the most spectacular shades of yellow I have ever seen. I remarked to Brooke that we have to stop by on the way back to get some pictures. Our plan was for me to drop her off right at the gate so she could start her run and have a good indication of the distance she had ran. She told me to set the odometer and drive exactly 10 miles so she could time herself on her run. With this setup it was assumed that I could drive the eleven mile loop faster than she could run it….We were wrong! The day started out on a rough note. We had to stop by several different locations before finding a shop that could sell a one day non-resident licenses in a timely fashion. Our last hope was to find a fly fishing shop and head there. We ended up going to the Smoky Mountain Angler in downtown Gatlinburg where they got their licenses, some flies, and John got a sticker for his fly rod case and a t-shirt/hat combo. After getting a bit of a late start we made our way over Newfound Gap and into North Carolina to fish the Oconaluftee River (the Smoky Mountains National Park portion). 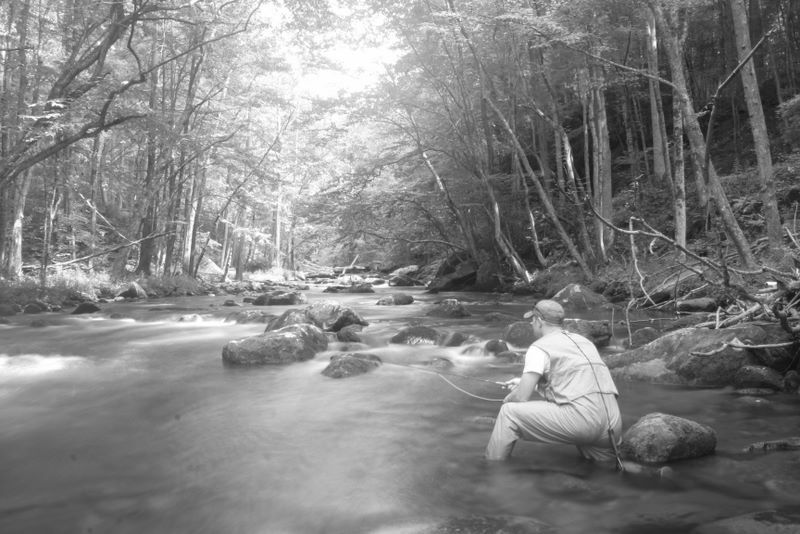 We parked on the Southern portion of the Smokemont Campground and began fishing. After a brief introduction, Mike, Cole, Jason, and Brian caught on very quickly to fly fishing in the Smokies and adapted to their surroundings well. I was using a dry fly, as was Cole. Everyone else was using nymphs. There were several sections that looked to be ideal for a dry fly, but we couldn’t get anything to rise. John caught two nice sized Brook Trout (called spec, specs, or speckled by locals). John slipped on a rock and got the tip of his fly rod caught between two rocks, snapping the end of it off. Needless to say, John was discouraged, as it was a Scott fly rod (which definitely isn’t cheap) and he had planned to use it on his upcoming trip to Montana. Fishing was a little slow on this narrower portion of the Oconaluftee so we decided to go into Cherokee so that everyone could (hopefully) catch a fish in the stocked waters. After paying our $7 each license to fish in the Cherokee Indian Reservation, we got out and explored the wide Oconaluftee. The fishing was decent, as all of us caught at least one fish except John (who was a little down after breaking his rod and acted as more of a “guide” spotting out the best waters and helping all of us). There was one deep hole we found and fished for a long time, with Cole pulling out a nice sized rainbow as did Jason. We fished to some stocked golden trout for a while, but couldn’t get them to take anything. My wife Brooke joined John and I for our fishing expedition on the Little River. She accompanied us the last time we went fishing in the Smokies a couple years ago. 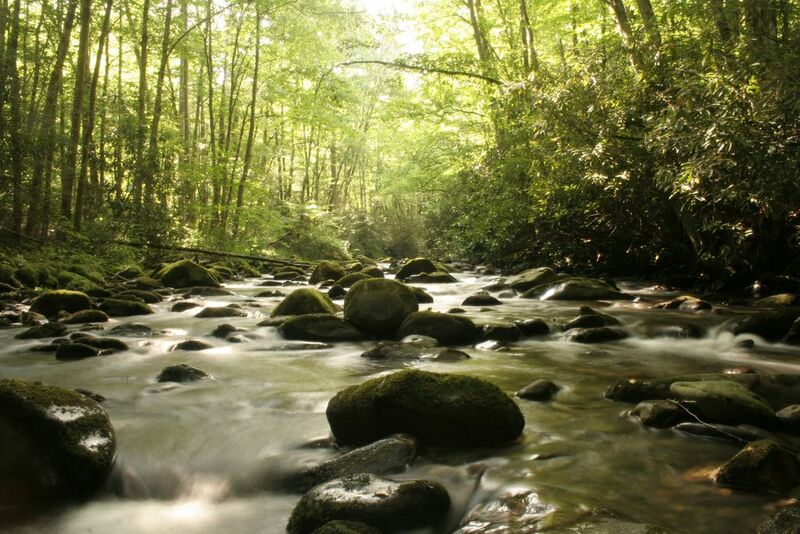 On our last expedition, we fished Porter’s Creek (in the Greenbrier area), the Little River, Jake’s Creek, Cataloochee Creek, and Abrams Creek. She is a trooper when it comes to outdoors type of things. 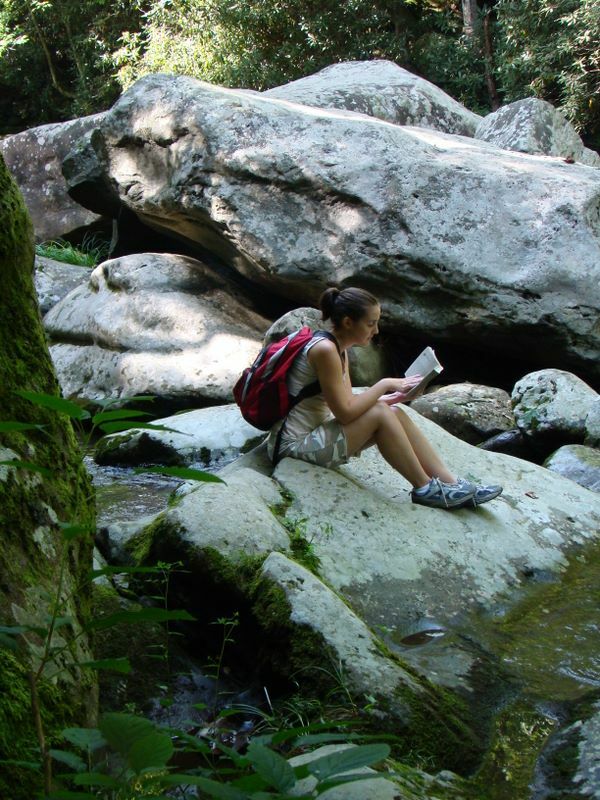 She hikes along with us with her backpack with all sorts of snacks, drinks, camera, and of course her many books to keep her occupied while we are fishing. I was surprised she decided to make the trip again considering she got chiggers in the Elkmont area around the time the fireflies were in their prime. We got to Little River Outfitters before they opened their doors. Once they opened up, several fishermen including us quickly entered and we began selecting some of the best flies to match the hatches during this time of year. We stopped to chat with one of the employees for a while who had some experience fly fishing in Montana where John is going in a couple weeks – around the Cooke City area. The fishing of the Little River was decent. John had caught three fish within the first 20 minutes or so – all rainbows. As we drove along Little River Road we tried to cherry pick the best spots. Surprisingly we fared better closer toward Townsend rather than the section between Metcalf Bottoms and Elkmont with the higher elevations and cooler water temperatures. 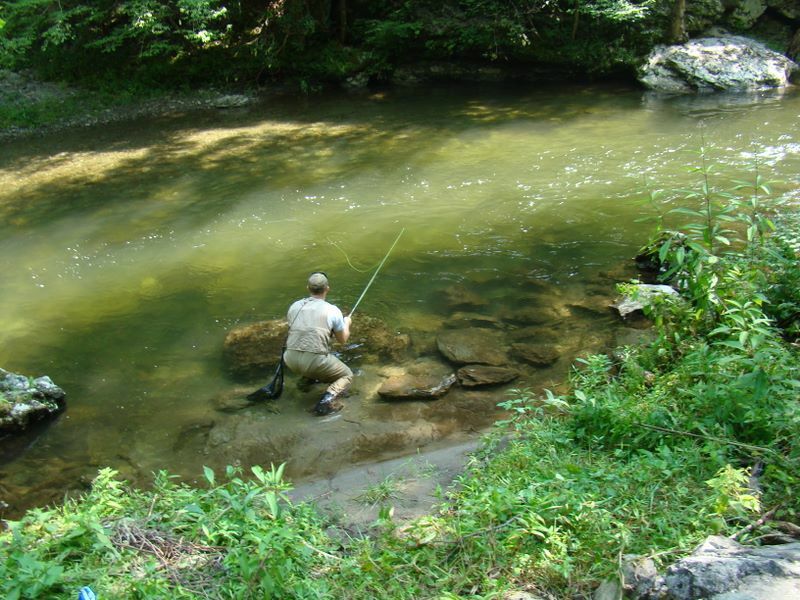 We ventured into Elkmont and went to check out Jake’s Creek again, but decided to just go ahead and fish the East Prong of the Little River instead as we were more familiar with this portion of the river. We got some excellent photos of the beautiful scenery along the Little River and John again caught a couple rainbows. Columbus Ohio Homes - Columbus Ohio Realtor – Jim Fradd – Re/Max Affiliates offers homes for sale in Dublin, Ohio. TN Real Estate License #313792. TN Contractors License #60031 - Dunright Builders, LLC.